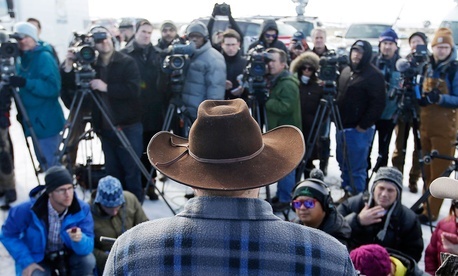 AP Photo/Rick Bowmer Ammon Bundy speaks at a news conference on Jan. 6 at Malheur National Wildlife Refuge. As federal officials take a hands-off approach to the standoff with armed militants who have occupied Malheur National Wildlife Refuge near Burns, Ore., the militia members have responded this week by escalating the situation on the ground. In a statement Monday, Harney County Sheriff Dave Ward said the militants, many of whom came from outside the state to take over a federal building on the wildlife refuge, had engaged in a pattern of harassing local law enforcement officers and federal employees. According to a report in The Oregonian, Ward said law enforcement officers were followed home and watched, and federal officials also were subject to intimidation. The Pacific Patriot Network, a coalition of militia groups, denied organizing or encouraging such tactics. Meanwhile, The New York Times reported that the protesters on Monday stole a Wildcat excavator from the Fish and Wildlife Service and used it to knock down a barbed-wire fence at the end of the refuge. The move was aimed at allowing a local rancher to graze his cattle on federal land. “The steps they’re taking—the occupation they’re doing—actually robs the American public of experiencing one of the premier wildlife and birding refuges in the United States,” an FWS spokesman told the Times. Ammon Bundy, the leader of the militants, said the group had accessed government documents in the occupied building, the Associated Press reported. Bundy said the documents would be used to “expose” federal tactics used against ranchers.